The online sale of food and beverages industry is likely to go up by 21 percent in the coming five years. The growing trend is a reflection that consumers want to avoid the brick-and-mortar grocery store checkout hassles switching to online shopping. Despite all, only 1-2 percent of shoppers who visit an eCommerce website conclude a purchase. Why is there so much of drop-offs? Let’s see what best can be done to optimize the conversion prospect of a Magento store. The shopping experience is scattered across multiple devices from desktop and smartphone to tablet. But delivering an engaging and integrated shopping experience, you can reduce the drop-off probability. Making it happen is not a big deal as Magneto is home to an array of mobile-responsive themes, and also provides you with a gamut of social media integration options. So a prudential Magento development makes sure that the disparity of devices or social preference doesn’t disconnect the shopping experience of users. Thus, without losing the way, a shopper can pick his or her last point of the journey and take it forward to a conclusive point, i.e. conversion, here, it’s a sale. Customers are very particular regarding their eating habit and, interestingly, no two consumers can have it the same. Besides, there are factors like demographics and region that influence their choice. Hence, it’s very difficult for a food business to take care of the interests and preferences of its consumers. 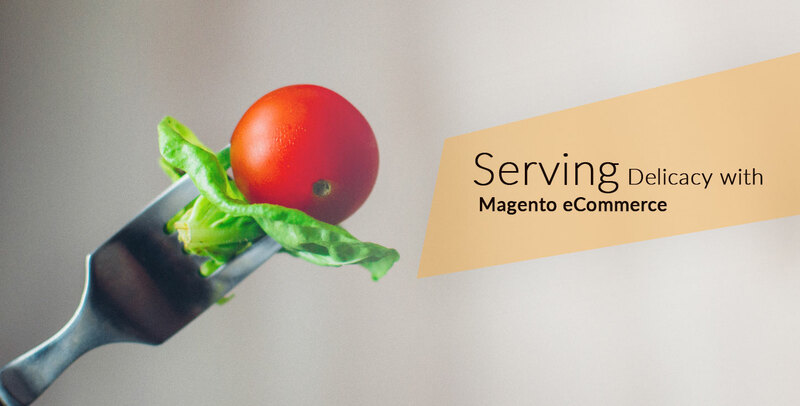 Fortunately, with Magento eCommerce development, you can take care of all. Based on their past purchases and website navigation patterns, you can create customized profiles and segment them into different categories and, accordingly, suggest them the right food item or the combination thereof to achieve higher conversion. Incorporating a suitable web analytics tool like CrazyEgg, Mixpanel, or Google Analytics with your Magento website, you can read better about your portal users and optimize your conversion rate. Skip a separate registration process, rather make it a part of the checkout itself. Don’t ask customers to complete a checkout, if an item is not available. Let customers easily modify their orders going a step back. Provide real-time support, rather than expecting them to read your FAQs or support page. Instant chat and phone are appreciable. Let customers review the purchased item before they go to a link. Provide photos, product specification, link, etc. along with product name. Provide a progress indicator moving from sign-in/sign-up to billing & shipping, payment, verify or edit. Inform users of the delivery times. Foods and beverages are perishable goods and, hence, a risk factor is always associated with the business. If the timely delivery fails, you lose not just the profit but also the whole cost put on that. In addition, the customer dissatisfaction is something that comes effortlessly. As customers placing the orders are often very impatient. So food delivery business is a double-edged sword. Your profit and loss both are linked to the way you deliver. Integrating your Magento store with key business databases or systems including ERP, PIM, POS, and CRM, you stay informed about the whereabouts of an item on the delivery route. With smooth management of order inventory and logistics across multiple systems and partners, you can make the delivery process efficient and cost-effective and stay up to the expectation of the shoppers. Therefore, with Magento eCommerce development ensure timely delivery to significantly boost your margins. The recommendations, we hope, will help you maximize the user engagement, trust, conversion and repeat business probability, and let you make the most of your technology and digital marketing investment. Looking for professional eCommerce development services? Building envying and engaging digital stores using Magento, WooCommerce, Drupal, and others, we have been instrumental in empowering business to gain authentic growth since 2004.